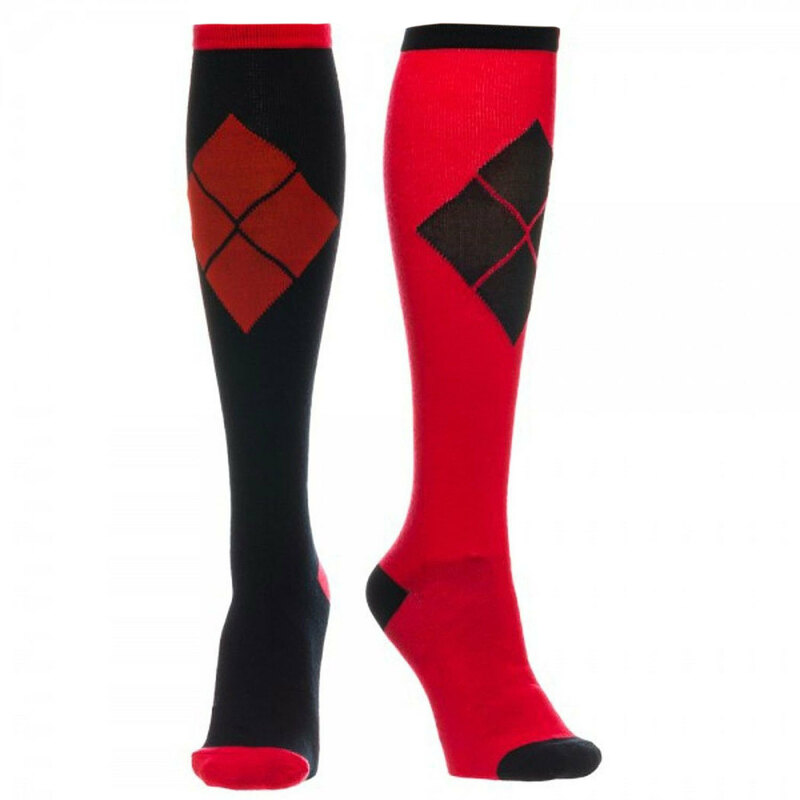 Visit our Store New Arrivals Harley Quinn Knee High Women's And Black Socks Officially licensed Harley Quinn socks. These knee high socks come in black and red. Women's 9-11. 100% Secure Ordering Most Orders Shipped Within 24 Hours Easy 60-Day Return Policy Satisfaction Guaranteed Click for alternate views Payment All forms of PayPal are accepted. We are sorry - we can not accept mailed-in payments. Your satisfaction is our greatest concern! If you are not completely happy with your purchase, please contact us and we will make every effort to remedy the situation. We accept returns within 60 days for a refund of the purchase price minus a 3.99 restocking charge, due to the listing having free or reduced shipping. Buyer is responsible for all shipping costs. Items must be returned in the original unworn, unwashed condition with all original tags where applicable. We inspect all items and packages before shipping, but if you receive a damaged or incorrect item, please contact us before returning your item, so we can correct the issue properly. General Are your items officially licensed? Yes! All of our brand-specific items are officially licensed, and manufactured by professional silk/screen printers. These are not iron-on transfers. Items listed as 'original' in the description are our own creations, still printed by professional printers. Are your items brand new? Do they have tags? Yes! All items are brand new direct from our warehouse in Pennsylvania. Note that your item may or may not come with tags. Some manufacturers include them, some do not, and sometimes they just come off while stock is being moved around in the warehouse. Your item is still brand new and licensed. Do you have (this size) in stock? Our currently available sizes are listed in the menu near the Buy button. Our stock updates daily! If there is no size selection, that means the item only comes in one standard size. Do you have this item in another color? Items are only available as shown in the photo. Shipping Do you combine shipping? Yes, we combine shipping! Shop thousands of items in our store and combine your purchases for one low shipping rate. Please purchase all items BEFORE paying so can combine the shipping for you. How long will I have to wait for my item? In-stock orders are typically processed and shipped within 1 business day. If you need your item by a certain date for an event or gift, we urge you to select Expedited Shipping. 's shipping estimates for Standard are not guarantees and are often incorrect. Do you ship internationally? Yes! We ship worldwide! How can I track my order? USA customers: You will receive a USPS delivery confirmation number when your order ships. Note that this can take 48 hours to update and sometimes, it will not update until delivery is made. International First Class: The number you will receive is customs form number. The USPS does not provide tracking service for First Class International Airmail. Shipments usually take about 2 weeks to arrive, but customs in your country can often cause delays. It is not uncommon for international shipments to be delayed for days or weeks - possibly up to 8 weeks. International Express: This service DOES have tracking and is the quickest, safest option. Shipments usually take 1-2 weeks to arrive. Automate your online store and usingsaleBlox!